BANGKOK: Thailand yesterday freed a jailed refugee Bahraini footballer with residency status in Australia, after Bahrain abandoned its bid to seek his extradition, and immigration officials said he was immediately driven to the airport. Hakeem Al-Araibi, 25, who fled Bahrain in 2014 and received refugee status in Australia, was arrested in November last year at a Bangkok airport while on a honeymoon trip, following an Interpol notice issued at Bahrain’s request. However, the Middle East nation has withdrawn the request, prompting a Thai court to approve a motion by prosecutors to drop the case against the footballer, Thai officials said. “There are no grounds to hold him anymore. It is his right to decide where he will go next. He is a free man,” said Chatchom Akapin, an official in the Thai Attorney-General’s office. A Reuters witness said Araibi was seen leaving the Bangkok remand prison in a car and immigration officials said he was heading for the main international airport in the Thai capital. Rights group Amnesty International, which lobbied for his release, later said Araibi had arrived at the airport. It was not immediately clear when or why Bahrain withdrew its request. A Bahrain government spokesman declined to give details when asked who ordered the halt of the legal proceedings. However, authorities in Bahrain, which has accused Araibi of crimes committed during the Arab Spring protests of 2011, said the country reaffirmed its right to pursue legal action against him. In a statement, Bahrain’s foreign ministry said it had noted the halt of legal proceedings and the verdict against the footballer remained in place. Thailand’s Ministry of Foreign Affairs said it had no comment on the case. 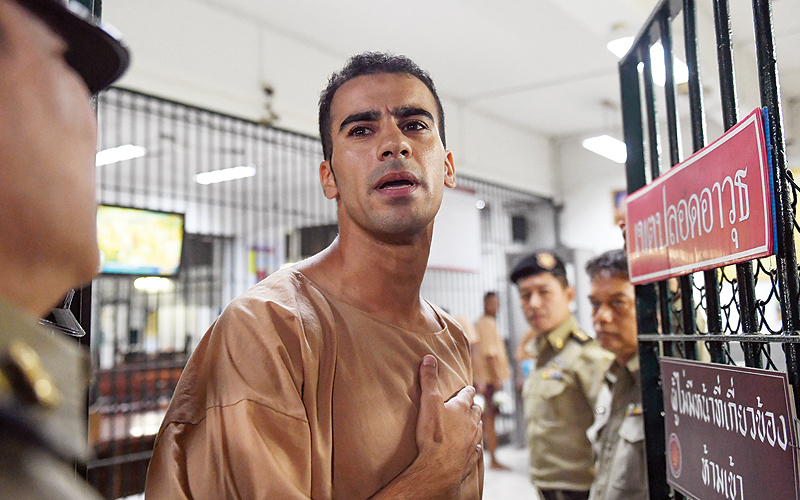 The detention of Araibi, who appeared with his feet in shackles at a court hearing last week, drew international criticism, with Australian authorities and fellow footballers urging Thailand to release him. He says he faces torture if returned to Bahrain. In the Australian capital of Canberra, Prime Minister Scott Morrison welcomed the decision of the Thai government. “We greatly respect the process that they have had to work through and we greatly appreciate their listening to the issues that have been raised by our government and many others,” he told a news conference. “Now the next step is for him to return home. But as it always is in these cases, people aren’t home until they’re home,” Morrisson told reporters. On social network Twitter, former Australia soccer captain Craig Foster, who had helped lobby officials at world governing body FIFA, said, “My thanks go to the wonderful people of Thailand for your support and to the Thai government for upholding international law.” Araibi has said he wants to return to Australia, where he has lived since 2014 and plays for a Melbourne football club. He was convicted of vandalizing a police station during 2011 anti-government protests in Bahrain and sentenced in absentia after he fled. Araibi denies the charges, saying he was playing in a televised soccer match at the time of the police station attack. New York-based Human Rights Watch has said Araibi was tortured by Bahraini authorities because of his brother’s political activities during the 2011 protests. Bahraini authorities deny allegations of torture. The reversal comes a day after Thailand’s foreign minister met with Bahrain’s Crown Prince Salman bin Hamad Al-Khalifa in Manama to “discuss… areas of interest”, according to Bahrain’s state-run news agency.